I think it’s been some time since I’ve read a book as difficult as this one. 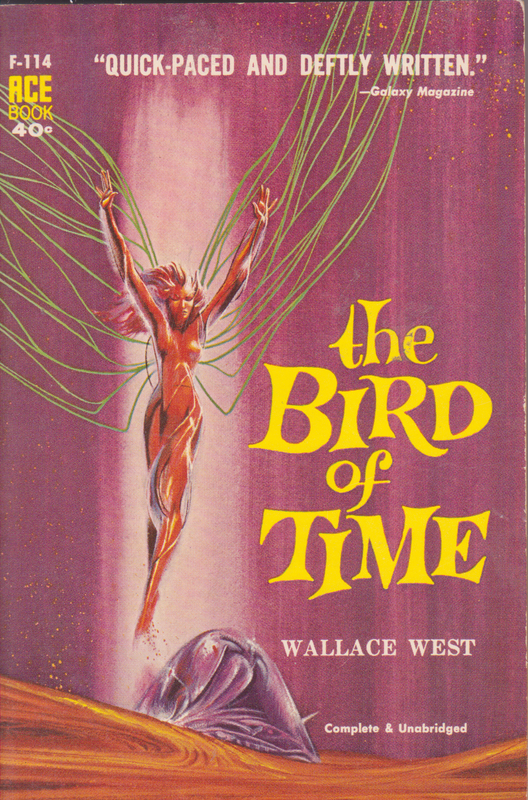 It wasn’t especially high-concept, and the prose was decent enough, but it was another one of those boring reads that kept repelling my brain despite all my better efforts to concentrate. I guess it was just boring, more than anything, but it also had a lot of nothing going on that was disguised as a lot of plot. None of it felt important, and what did come across as the point of the story felt heavy-handed and couched in some weird Freudian dynamics. I wasn’t thrilled, but I also wasn’t annoyed enough to be interested. The book is interesting in at least one respect. It was originally serialized and was put together to make the novel. What’s interesting is that it was serialized across both Thrilling Wonder Stories and Astounding over the course of two decades. I don’t know what parts of the book were written when, but the fact that I was reading something that was begun in 1936 and didn’t conclude until 1953 was pretty evident throughout. I feel like it was chronologically written, but I can’t be sure. For instance, the earliest written part was entitled “En Route to Pluto” when it was first published, but Pluto doesn’t even make an appearance in this book, so I have no idea what that’s all about. While that’s all really interesting and all, it did end up making the book feel a bit rough around the edges. The first section was significantly more interesting than the latter two, and the three bits didn’t feel like they went together in anything more than sharing characters and a few concepts. As a result this book started off as fairly easy to read in the beginning, but it became an uphill battle as it progressed. The first part of the book, though, is pretty good, like I said. We’re introduced to two characters, Bill Newsome and Jack Harkness. No, that is not a typo or a slip. This guy actually has the same name as our favorite omnisexual immortal Doctor Who character. I found this hilarious. We also meet some Martians at the beginning of the book and learn a bit of their ways. They’re evolved from birds, but only some Martians currently have wings, and those that do are all female. Mars is dying. The Martians have exhausted all of their resources, and so their planet is the great big red dust bowl that we’ve all come to know and land rovers on at every opportunity. Bill and Jack aren’t the first people from Earth to visit Mars, though. There was a previous expedition, led by some guy named Captain Brown, that was the first formal introduction to the Martians. Bill and Jack are arriving ahead of the Second Expedition. I wasn’t sure if they were official scouts or if they’d headed out on their own to get a jumpstart. It felt like it went back and forth a bit. Either way, they meet Martians like Mura and Yahna and learn their ways. Mura is the Pitaret, which is kind of like a prince. Yahna doesn’t get her own Martian word but she’s a princess. What makes this all a bit weirder, though, is that Mars doesn’t actually have a government. They refer to themselves as the “Anarchiate” and get all high-and-mighty about the fact that Mars doesn’t need a government like all those backwards Earth people. It helps that Martians are telepathic. Mura has some grand schemes and he’s willing to get Bill and Jack in on the deal. It turns out that Mars used to be a galaxy-spanning empire (well, it had something like three planets, but they spanned the galaxy) and that Empire was based on instantaneous teleportation. He sends Jack and Yahna to a place on the planet to retrieve an old teleporter from some old lady named the Avron. Once they get the teleporter back maybe they’ll be able to make it work. There’s a bit of an adventure while Bill stays back and helps Pitaret Mura get some stuff done and deal with the forthcoming Second Expedition, led again by Captain Brown, a man who really likes to quote Keats. It also looks like the humans and the Martians are doing a decent job of attempting to double-cross one another. I liked this part. The humans are sending a bunch of “diamonds,” actually cubic zirconia, to trade for gold. The Martians have a lot of gold. Back in their heyday, it was the waste product of their power generators. It’s practically an annoyance. Pitaret Mura knows full well what the humans are planning and that they aren’t really sending diamonds. What he doesn’t reveal until later is that diamonds would be useless to him anyway and that cubic zirconium is useful to Martian power generators. He might even be able to jump-start Martian civilization back into the big leagues again. He also plans to send the Earthmen back with a lot more gold than they expected, something on the order of hundreds of tons, knowing that the greedy humans will think they got the better end of the deal and also knowing that once all that gold got back to Earth it would destabilize their economy (I guess Earth is still on the gold standard) and prevent them from launching any more expeditions to Mars in a long while. That long paragraph was pretty much all the good parts of the book. Captain Brown and his men are hanging around on Mars. Jack and Yahna show up with the teleporter and they get it working. They teleport to Polaris III as a sort of forward expedition. Captain Brown starts a fight and steals the teleporter. Jack and Yahna aren’t able to home in on the teleporter to get back, so now they’re stuck. Mura goes a bit nuts and Bill shoves him into a different teleporter and sends him to another planet. The first section (and I assume the short story it was based on) ends on this cliffhanger. Except then section two kicks off, some years down the line, and things were just resolved in the meantime. New problems have arisen, but it turns out that the Martians recovered Mura, who is now in charge of the Martian non-government, not long after part one ended. Jack and Yahna are still on Polaris III, but they get back soon enough. The rest of this section, which is also the largest section, takes place entirely on Earth and is mainly through Bill’s point of view. Bill is working for the nominal world government, the UN, and is a propaganda officer. His job is important because the Martians are spewing propaganda at the Earth in such a way that it affects every man, woman, and child. They’re doing it telepathically, and even more insidious is the fact that this telepathy is directed at each person individually. It has something to do with prodding the id more than sending direct messages. I guess that’s kind of neat but since this whole section was about that it just wore thin. We see that even though the UN has taken over governance of the Earth, there are still three major political entities, namely the capitalists, the socialists, and the communists. They are at odds with one another and part of Bill’s job is preventing communist propaganda from getting through to his capitalist nation, all the while trying to offset the Martian propaganda that’s hitting people where they can’t do anything about it. All this is complicated and boring to read. I’m sorry. Jack and Yahna show back up and Yahna gets put on television. The plan is something like “endear her to the people of Earth and then send her back to Mars for peace talks so the humans know that she’s actually on their side.” Again, overcomplicated. I feel like there wasn’t much of a conflict in this part so much as a bunch of little interpersonal conflicts between flat characters I couldn’t bring myself to care about. I do remember that one of them was a South African woman pretending to be French. It felt like it was going to be important at some point but I don’t think much came of it. She was racist, she hated Martians even more than she hated the one-eighth-black guy in her office, and at some point she decided that maybe she shouldn’t be quite so racist. This whole part ends when somebody finds Pitaret Mura on Earth (he used a teleporter) setting up a mental broadcasting station. They capture him and then start negotiating with the Martians and it looks like everything’s going to be okay. Jack and Yahna go back to Polaris III in an effort to start up a full-on colony to help provide resources to both Earth and Mars. And then we start part three, yet again some years in the future. Earth has gone to crap. We’ve lost almost all our topsoil, there are dust storms raging across the planet, and our resources are nearly extinguished. There’s a dictatorship running the world (or large chunks of it) based on Freudian principles, namely trying to suppress the human super-ego so that the id and ego can run free and come up with brilliant ideas to save the world. I don’t know an awful lot about Sigmund Freud’s psychoanalytic principles, so I don’t know how stupid this is. I do know that he’s fallen out of favor over the last fifty or so years, so there’s that. Jack and Yahna are stuck on Polaris III. Again. This time Jack manages to get back to Earth and see how awful things are going. His old buddy Bill is in an insane asylum or whatever this future’s equivalent is. The reason they got stuck on Polaris III again is because everybody forgot about them. Part of this psychoanalytic takeover of the western world led to some severe difficulties in long-term planning. Seeing as how that was never humanity’s strongest suit in the first place, this is bad news. The biggest plan of the moment is to melt the polar ice caps intentionally to see if there’s any arable soil beneath them. Basically everybody is really stupid and they’re all suggesting really stupid plans in an effort to save the world. This third part was really short compared to the other two, and it felt even more pointless. Really all that happens is that Jack heads back to Polaris III after rescuing Bill and talks over some stuff with him and Yahna. They decide that the problem lies in humanity’s triple nature of id, ego, and super-ego. Perhaps they should be more like the native inhabitants of Polaris III, the Pog, who don’t seem to have any of those problems because their minds are more melded than those of Earth or Mars. So they all invite the “Psychos,” basically the folks running the world, to Polaris III for a dinner party. It goes over pretty well. They finally work their way up to the main guy, who turns out to be a Martian. Specifically the Avron. Remember the Avron? I barely did. Seems she was in cahoots with Mura for a while. And she and Mura decided that the best way to destroy humanity would be to get them a bit more like that. Like we aren’t already mostly like that anyway. And so once that complete not-a-mystery was revealed the book ended. Except that the Pog decide to help us figure some things out. That was the real end of the book. It’s hard for me to look at this book as anything more than a lot of blegh with the occasional oh neat. And the oh neat moments were few and far between. This was an incredibly boring book. Oh, about the title: I think the title came up once. I think Jack said it. I don’t remember the context. I don’t think it was important. And I guess that’s okay. Except that the big problem, that of dumb humans, probably can’t ever be resolved, while the problem of the Martians was resolved over the course of a few paragraphs here and there. The bits of Freud felt both old-fashioned and tacked-on. Almost more than old-timey astronomy and physics, old-timey psychology really dates a book for me. Psychology and whatever interpretation of the human drama is currently fashionable seems to change so quickly that it’s really hard to take a book dealing with it seriously. If it’s old it’s hopelessly dated, and if it’s new then there’s the awareness that this book is soon to be hopelessly dated. I find psychology interesting but I also find it hard to take it seriously sometimes. But that’s about all I’ve got to say. This was a balloon book. It had some stuff floating around on the outside that made it worth looking at, but once I got curious about the inside it deflated. Boy, this sounds like book with a couple of interesting and glorious ancient science fictional ideas, especially the Freudian backdrop, but smothered under a lot of nothing happening.